Cryptozoic Entertainment has been pretty busy with creating games based on various popular television franchises. And their efforts in support of the ever popular animated series Rick and Morty have resulted in some rather quirky games. 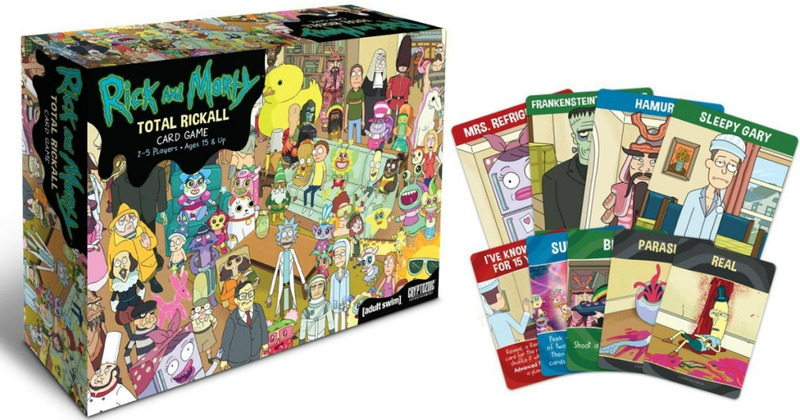 Of course it makes sense that they'd come up with a game based around one of the show's most popular episodes, Total Rickall, which involved the family being locked in the house with memory-altering alien parasites. And how that translated into a game concept is kind of bonkers. Rick and Morty: Total Rickall is a sort of deduction card game designed by Matt Hyra that can be played as a cooperative game or a competitive game. The game supports 2-5 players and runs fairly quickly. In the game's basic cooperative mode, players must try to figure out which of the house mates are real and which ones are parasites. This is done by everyone choosing a card to play from their hands then resolving those cards. These can trigger effects to confirm if characters are real or fake but also to mix them up to make things more confusing. Effects are typically tied card colors (blue, green, red) or some special white cards that have other effects. At at time the players think that all the parasites are dead, they can check all the characters if they are real or a parasite. In the advanced mode, players have a particular character in front of them that may also be real or a parasite. Now players can be on one of two sides - those supporting the real family members and those supporting the parasites. The real people naturally want to clear out all the parasites while the parasites need to keep at least one parasite alive until the end of the game. What I Liked: With very simple rules, the game nicely found a way to capture the feel of the episode and translate it all into a pretty good card mechanic. It's a different spin on the usual sort of loyalty / traitor games out there and nicely adapts to both cooperative play and competitive play. The basic mode is hard enough with new characters joining the table every round but the advanced game can be pretty bonkers. The advanced mode is really where the big fun is as it adds a whole new level of gameplay to things. It's sort of like what the advanced rules for Legendary Encounters as the core challenge of the game itself remains but now you need to figure out who's on your side. It's not like you know who else are Real or Parasites among the players and card effects also allow you to switch around the cards including those in front of players. So it gets rather bonkers. What Could Have Been Better: That said, the basic game is quaint but can get really boring the moment you try out the advanced rules. The core challenge of finding all the parasites can be mitgated pretty quickly when you have at least 3 players in the basic game. It does keep it safer for a larger audience but at the same time it could have been maybe a notch or two higher on the difficult ladder. I'm not sure if the final dinner table scenario in the advanced game was absolutely necessary in order to find an end to the game. Sure it makes things interesting and it forces everyone to make a final decision regarding the situation and whether or not it's "safe" for your team (whoever they are). It's quirky and messy but maybe not the best way to go. TL;DR: Rick and Morty: Total Rickall is one of the best Rick and Morty games in circulation but it's not necessarily a home run. It's certainly a lot of fun and it pays off to learn how to play the advanced rules as soon as possible in order to get the most out of this game, especially among more experienced players. Thus the game gets 4 parasites hiding in your memories out of a possible 5.